HTC has just launched its latest flagship phone, the HTC J Butterfly HTV31 in Japan. Taiwanese smartphone and tablet manufacturer, HTC has announced the release of its new flagship model handset, the HTC J Butterfly HTV31 for exclusive distribution by Japanese carrier, KDDI. While HTC also launched a similarly-named smartphone, the HTC J Butterfly, in mid-summer last year as a lower-spec option to the One M8, this latest model carrying the HTV31 iteration is a successor to the J Butterfly, and features better specifications. Presenting a 5.2-inch Super LCD3 Quad HD display, the new handheld is powered by an octa-core Snapdragon 810 chipset, and runs on Android 5.0 Lollipop out of the box. 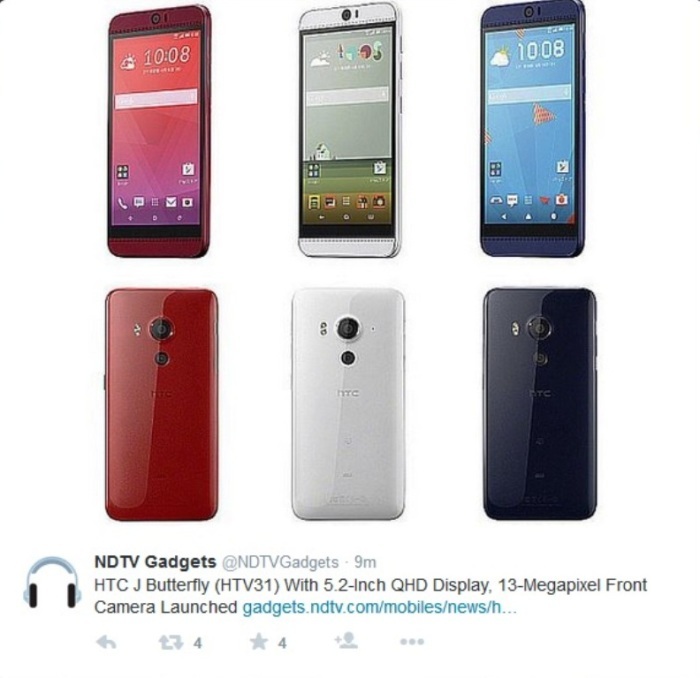 It is equipped with HTC's Sense 7 UI, and has 3 GB of RAM and a 32 GB built-in storage, expandable via microSD. The J Butterfly HTV31 offers users a 20.2 MP DUO rear camera specializing in post-shot selective focus and for capturing images at a distance, as well as a 13 MP front camera. The main rear camera has 2160 video capabilities, and comes with a number of creative effects modes. The phone is equipped with a 2,700mAh battery that supports 110-minute quick charging, and has dual speakers in front providing high quality audio. It supports Wi-Fi, LTE, and NFC. Housed in a 151mm x 73mm x 10.1mm polycarbonate plastic body, the J Butterfly weighs 162 grams and is protected from the elements with an IP55/IP57 rating, making it both dust-proof and waterproof. It will be available in blue, indigo, red, and white variants, all with a glossy rear finish. The J Butterfly HTV31 is expected to be released in early June at KDDI with an as yet unrevealed price point. The international launch date of the new smartphone is still pending announcement.